Close-up images of asteroid (2867) Steins, obtained with the OSIRIS cameras on Rosetta, have provided extensive new measurements of the physical properties of this main-belt asteroid. Steins is revealed to be a loosely-bound 'rubble pile' whose diamond shape has been honed by the YORP effect. This is the first time this effect has been seen in a main-belt asteroid. The results are reported by H. Uwe Keller and colleagues in the 8 January issue of Science magazine. Most models of Solar System formation posit that the planets formed from the collision and eventual coalescence of planetesimals. Beyond the orbit of Mars, the gravitational perturbation of the giant planet Jupiter prevented the formation of a planet-sized body by disrupting the orbits of many of these planetesimals. The remaining bodies, some of them several hundred kilometres in size, have undergone frequent collisions since this time and today mostly occupy the asteroid belt between the orbits of Mars and Jupiter. Asteroids are of interest for understanding the formation process of our Solar System because they carry information about the nature and composition of the Solar System at an early stage of its formation. Asteroid (2867) Steins, an E-type asteroid, is a rare type of solar system body. Only a few tens of these asteroids have been detected. In the results published in the 8 January issue of Science, H. Uwe Keller and colleagues report on observations of asteroid Steins obtained during the Rosetta flyby of 5 September 2008. 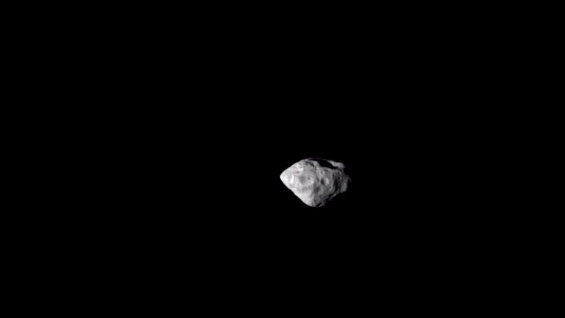 This is the first time that a close-up view of an E-type asteroid has been obtained. The closest approach to the asteroid was at 18:38:20 UTC at a distance of 803 km. About 60 per cent of the surface was resolved during the flyby providing a unique set of images from which a number of important physical properties can be inferred. Little was known about asteroid (2867) Steins when it was chosen early in 2004 as one of the targets for a close flyby during the Rosetta mission. At the time, it was classified as an E-type asteroid on the basis of its visual and near-infrared spectrum and its high albedo. Later, ground-based observations estimated a diameter of approximately 4.6 km and determined a rotation period of about 6 hours. The new OSIRIS images show Steins to be an oblate body, resembling a brilliant cut diamond, with dimensions of 6.67 × 5.81 × 4.47 km³. Its surface is mostly covered with shallow craters with some of the larger craters being pitted with smaller ones. Analysis of the impact craters reveals a deficit of small craters (those with diameter less than 0.5 km) which Keller and his colleagues attribute to surface reshaping as a result of the Yarkovsky-O'Keefe-Radzievskii-Paddack (YORP) effect (see footnote). The effect would have caused landslides which filled-in the smaller craters. This is the first time that the YORP effect has been seen in a main-belt asteroid. Two remarkable features are clearly visible in the images obtained near closest approach: a large, 2.1 km diameter crater located at the south pole, and a chain of pits which extend northwards from this crater. Taken together these features suggest that Steins was subject to a big impact which created the large crater and caused fracturing of the asteroid body resulting in it having a rubble pile structure. This type of loosely-bound structure is also consistent with the YORP effect hypothesis. Spectrum of asteroid Steins (OSIRIS and ground-based observations). Detailed study of the OSIRIS images has also allowed Keller and his colleagues to confirm the nature of Steins as an E-type asteroid – the albedo and spectral characteristics are consistent with this classification - and to demonstrate that there is no measurable surface colour variation, which points to a homogeneous composition. The view of Steins obtained by OSIRIS during the September 2008 flyby with Rosetta has provided scientists with the first detailed characterisation of this rare type of solar system body. Footnote: The YORP effect is a phenomenon that occurs when photons from the Sun are absorbed by a body and reradiated as infrared emission which carries off momentum as well as heat. The loss of momentum causes a change in the rotation rate of a small body such as an asteroid. The resulting high spin rate of asteroid Steins could have caused material to migrate towards the equator of the asteroid resulting in the distinctive conical shape.